I’d seen this book on the list of Newberry honors (2003), so when I stumbled on it as a library Kindle download, I grabbed it to read over Christmas break. It’s a good one, in a relaxed, lazy day kind of way. 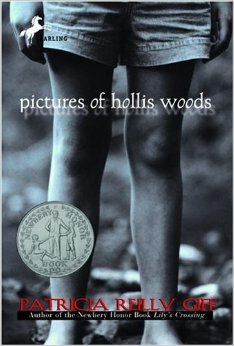 I couldn’t help but feel for Hollis, a twelve-year-old orphan girl whose dream for a family mingles freely with her talent for drawing pictures. The book feels a bit disjointed at first. Each chapter has an italicized prelude describing one of Hollis’s drawings, always done in the past. First, her desire for a family, drawn as a class assignment with a father, mother, sister, and brother. Then pictures of one family, nearly perfect, that she paints one by one. Chapters tell her present situation, entering a new foster house. An old lady this time, Josie, a former art teacher, someone who recognizes Hollis’s talent and her dreams. As Hollis slowly comes to love Josie, she also recognizes how forgetful Josie has become. How old. Josie needs Hollis as much as Hollis needs her. Nope. You’ll have to read it for yourself. Giff really gets us into Hollis’s head, showing us how this angry, trouble-making child is really an individual with talents and dreams and a nobility all her own. Two thumbs way, way up. It’s also a 2007 made-for-TV movie. I recently read this book as well and enjoyed it. A great review. Lol, I had to reread my review to remember the book. It was a good read! I read it last fall and it’s just showing up in the queue. It’s been bumped a few times for this or that. So like you — leave me hanging and wondering! Thoroughly enjoyed your excellent review. Sounds like a book I should read! Sorry to leave you hanging yet again, lol.